In the above table modifier ending with * indicates they are not keyword of c language. These modifiers are called as nothing modifier since there is not any special keyword in which represents those modifiers. If you will not write any thing it then compiler will understand you are writing nothing modifier of those groups. nothing: It is not short as well as not long. not_const: It is not constant. You can modify. Not_volatile: It is not volatile. not_interrupt: It is not sending interrupt signal. 1. Nothing modifier must be default modifier of that group. 2. 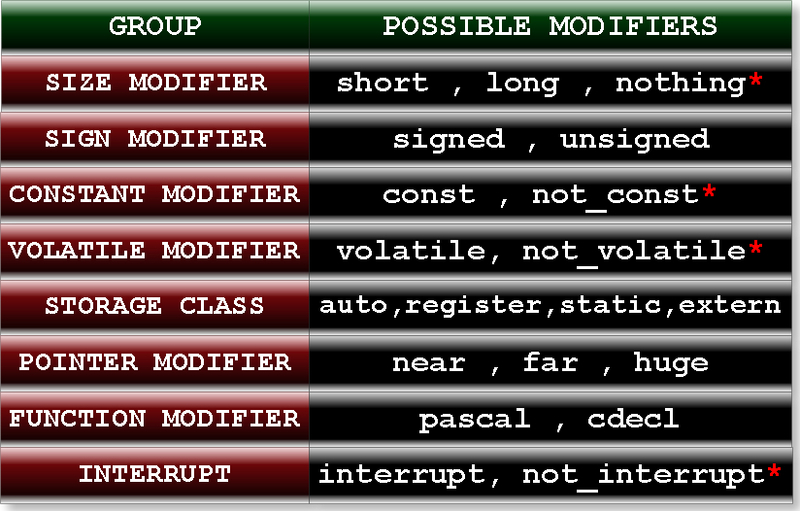 In LINUX GCC compiler there is not any concept of pointer modifier.